A website designed to convey leadership and trust. 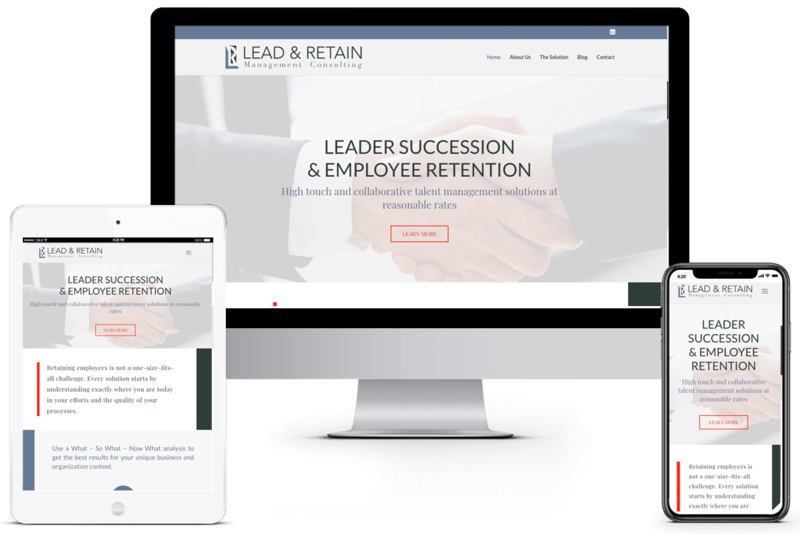 Lead & Retain Management Consulting firm provides experienced advice on leadership succession planning and employee retention within corporate environments. Founder of Lead & Retain, Dr. Joanne Stroud, chose Clicks Web Design as her web design and development team because, like her, we demonstrated a firm understanding of her project and provided no-nonsense answers to her web-related questions. Joanne came to the design table with a clear vision of what she wanted. We created several logo versions that were narrowed down quickly to her favorite. Once the logo and branding colors where decided upon, the design of her Divi website proved to be simple and straightforward. Joanne chose the popular WordPress content management system to support her Divi website because it provided her with the most flexibility to add and modify content on her own. With only minimal instruction on how to use Divi and WordPress, Joanne was able to add her own blog posts and make content changes easily. The logo creation process for Lead & Retain involved just 2 revision cycles before Joanne honed in on a style that fit her brand. Below you’ll see the versions created before the final version was selected and refined.